President Ram Nath Kovind was born in 1945 in Kanpur. 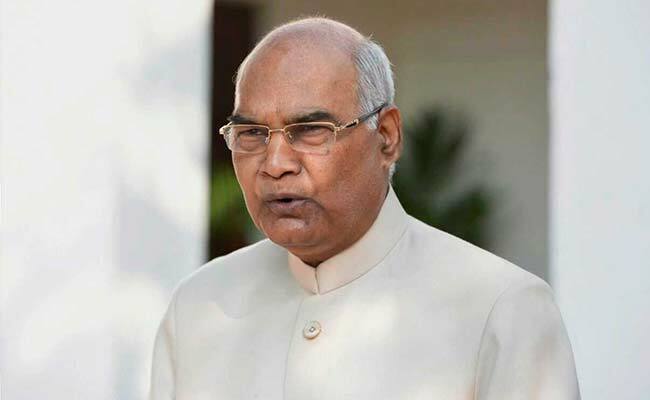 President Ram Nath Kovind is the second Dalit to hold the top constitutional position. New Delhi: Prime Minister Narendra Modi and several top political leaders extended their greetings to President Ram Nath Kovind on his birthday today. President Kovind was born in 1945 in Kanpur. "Birthday wishes to Rashtrapati ji. May Almighty bless him with a long and healthy life devoted to the service of our nation," the prime minister tweeted. PM Modi said that since his tenure began in July, the president has endeared himself to the people of India. "I have always found Rashtrapati ji to be sensitive towards the aspirations of 125 crore Indians, especially the poor and marginalised," he added. Bihar Chief Minister Nitish Kumar also conveyed his best wishes to President Kovind. "Birthday greetings to honourable Rashtrapati Shri Ram Nath Kovind ji," Mr Kumar said in an official release and wished him a very happy, healthy and prosperous life. President Kovind was the Governor of Bihar before being elected the 14th President of India on July 20 this year. He is the first leader with a BJP background and the second Dalit to hold the top constitutional position. West Bengal Chief Minister Mamata Banerjee today also greeted Kovind. "Birthday greetings to @rashtrapatibhvn Ram Nath Kovind ji," Ms Banerjee wrote on her Twitter handle. Telangana Chief Minister K Chandrasekhar Rao sent a bouquet of flowers to the President, an official release said. Several other top leaders and Union ministers conveyed their best wishes to the president.